One of the key business drivers behind SDN is to extract value from network connectivity. Before SDN, the functionality derived from connecting servers to switches was inherently valuable. 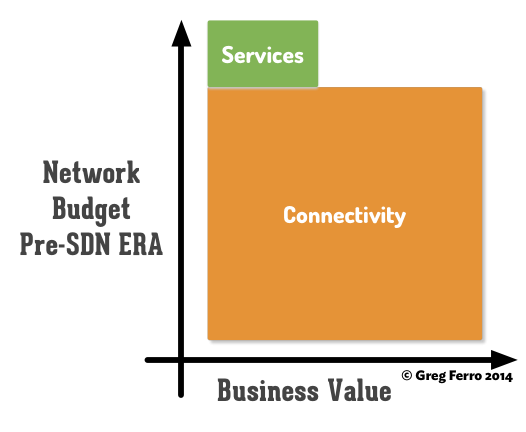 In the post-SDN era, the network has services value instead. Manufacturing quality has improved over time – network hardware is equally reliable from any vendor. Increasing volumes of network hardware has improved and industrialised its production. The production process for network devices – silicon, power supplies, airflow etc – is well understood and competitors can enter the market to challenge incumbents. Today, a networking budget is nearly 100% spent on providing connectivity such as WAN, LAN, Wireless or Campus networks. 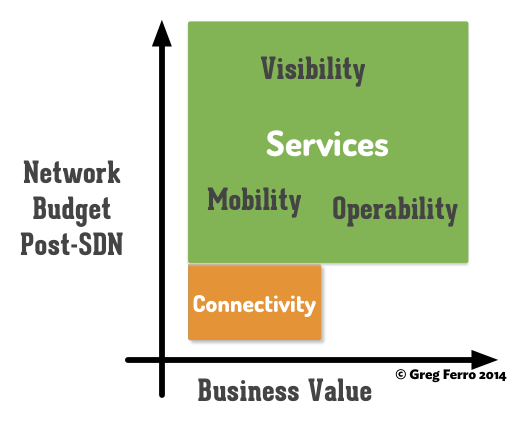 As the market enters the “Software Defined Networking”, the business value of the network moves from “connectivity” to “services”. I believe that network hardware will follow the trend of x86 servers over the last decade. The business value of server hardware is no longer derived from the fastest CPU or latest PCI bus but from the software that the server runs. The value of the servers is derived from its applications that deliver business services. Buy Services Not Networking – As network hardware trends to commodity products through volume and industrialisation, so does the business budget shift from buying “kit” to buying services. Connectivity remains vital but SDN provides ways to extract value from the networking. Consider that Google and Facebook extract value from knowing the network of connections between people, then SDN can extract business value from network of connections between devices, services and applications. The “SDN Age of Networking” is about finding Visibility, Mobility and Operability in the software layer of the network. This software layer offers the business new ways to extract productivity and profits. I see that this model shows that network hardware will become cheap and commoditised, like x86 servers, and that engineers can expect to invest time, money and expertise in software because it’s delivers services to the business. Connectivity is no longer enough.